BEACH BOYS: PET SOUNDS: 1966: 5 STARS OUT OF 5 STARS: A couple days ago Paul McCartney turned seventy- six– today Beach Boy Brian Wilson does. 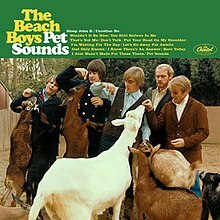 Brian always considered The Beach Boys in competition with The Beatles with this album- they were. Where Brian was inspired by Rubber Soul to do this- The Beatles were inspired by Pet Sounds to up the ante. In the end one man- Brian couldn’t keep up with The Beatles– but Pet Sounds is rightfully called and recognized as a masterpiece. Paul McCartney called God Only Knows- the greatest pop song ever. 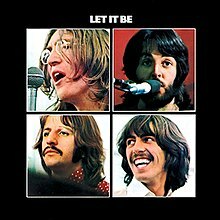 THE BEATLES: LET IT BE: 1970: 4 1/2 STARS OUT OF 5 STARS: The final release from The Beatles- Abbey Road was recorded after this but Let It Be sat in the can for a while as they decided what to do with it. My least favorite Beatles album-maybe because it was their last release- maybe because of the vibe around it. Some great songs on it- Let It Be- Across The Universe, Get Back, The Long and Winding Road and Two of Us- but not a solid effort from start to finish in my opinion. With some bands this would have been a career achievement not with The Beatles. Still 4 1/2 stars. One of the smartest decisions they made was letting it be at the right time. THE BEATLES: PAST MASTERS: 1987: 5 STARS OUT OF 5 STARS: Part II of the Past Masters picks up with the Day Tripper/ We Can Work It Out single and goes until the end of The Beatles- with the singles A & B sides that didn’t make it on to proper albums back in the day. Fabulous. Compiled by THE – Beatles greatest historian- Mark Lewisohn. THE PRETTY THINGS: S.F. SORROW: 1968:4 STARS OUT OF 5 STARS:English band who took their name from the Willie Dixon song “Pretty Things” This is a concept album- one of the first rock operas- about Sabastian F. Sorrow and follows his life follows his life through war, love, tragedy, madness and the disillusionment of old age. The story was based on a short story by their singer Phil May. This is the first time I have listened to the album- since it is part of my 1968 project I will be giving it more time as the year goes on. I will give it a 4 stars on first listen but that could very well change. The Pretty Things believe S.F. Sorrow influenced The Who’s Tommy- The Who deny that claim. DANIEL JOHNSTON: SONGS OF PAIN 1980-81: 5 STARS OUT OF 5 STARS: This brings back a lot of memories. In the late 70’s -early 80’s 4 or 5 evenings a week I’d run over to visit Dan- and hear the new songs he was working on. He had quit college and was back home and this is what he was doing all day- in his parents basement beating on the piano and writing songs. I would go over and listen to what he had produced on any given day. It seemed like every day he had a new song or two- most are represented on this album and on More Songs of Pain. He would perform a concert every evening- he would be sitting at his piano and I’d be in a nearby chair and I’d yell out a song he’d written and he’d play it. I don’t know how many times he played “Grievances” but there were times I’d have him playing it over and over. I thought he was writing tremendous songs and I was right. Recently one of his songs has been featured on an Apple television commercial. Maybe it is because I was there at the creation but I think his greatest songs are the ones he wrote early on on the Songs of Pain and More Songs of Pain album. Low-Fi at its best. All he did was sit at his piano with a cheap cassette recorder and record. I suggest you go out and buy as many Daniel Johnston albums as you can. Let It Be – I Dig a Pony… not my favorite off the album but only Lennon could have written that guitar riff. Two Of Us should have been a single to me… I always liked the Naked version of this album. I agree on Naked… and yes Two of Us- a great song. I know Paul has said it was about him and Linda but I always think of it as a lot about John and Paul. I totally agree. It would have been a perfect time to look back when the end was near…and he knew it.